The Sage of Omaha published his annual letter on Feb 24. He remained bullish on U.S. stocks over the long term. After all, stocks have performed better than bonds in the long run. Inflationary pressure is also brewing looming concern. This will affect bonds more than stocks because of their lower returns. Corporate America, in the meantime, has received a massive permanent tax break, which will further boost profits. Changes to the tax law has already provided the much-needed windfall to Berkshire Hathaway Inc. (NYSE:BRK.B), whose market value rose 21.9% in 2017, edging past the S&P 500’s return of 21.8%. Given the positives, investing in Berkshire’s largest stock holdings seems judicious. These companies have reliable business models that have stood the test of time. World’s third richest man, Warren Buffett, urged investors to ignore gyrations in the equity market, guidance from market pundits with fancy credentials and resist the temptation to scoop up bonds. He added that investors with long-term goals like pension funds and savings-minded individuals will make a “terrible mistake” if they measure their investment “risk” by their portfolio’s ratio of bonds to stocks. As the investor’s investment horizon increases a diversified portfolio of equities do better than bonds. Lest we forget, the S&P 500 that mirrors a huge cross-section of American businesses has returned an average of 10% per year, while long-term government bonds have returned 5% to 6%. Treasury yields are scaling record highs after a significant rise in wage growth sparked fears of inflation and led investors to believe that the Federal Reserve will hike rates more times than anticipated. The labor market has come a long way since the Great Recession, with wages growing at the fastest pace in January in more than eight-and-a-half years. Average hourly wages increased 9 cents, or 0.3%, to $26.74. This helped the average year-on-year hourly earnings to rise to 2.9%, the highest since June 2009. Several states have also raised wages. Minimum wage has been raised in 18 states in January, which had a positive impact on 4.5 million workers, per the Economic Policy Institute. Rise in bond yields, in the meantime, might tempt investors to take money away from equities and invest in bonds. But, Buffett cautioned that long-term bonds tend to generate less return than stocks and with rising inflation, bonds can really become a dumb investment. Needless to say, rising inflation erodes the value of the principal on fixed income securities. Buffett told investors that Berkshire got a lift from the new tax code. He wrote that Berkshire made a $65.3 billion net gain in 2017, which increased the per-share book value of both Class A and Class B stock by 23%. However, only $36 billion came from the company’s operations. The rest came from the new U.S. tax code, which slashed corporate taxes and in turn boosted profit margins. The House of Representatives passed the biggest overhaul of the U.S. tax code in 30 years. The headline-grabbing move lowered the corporate tax rate from 35% to 21%, while any income brought back from overseas is taxed 8% to 15.5%, instead of the current 35%. As mentioned above, business magnate Warren Buffet prefers investing in stocks rather than bonds. And why not? Berkshire has registered big gains last year with its stock holdings totaling a solid $170.5 billion in value. Thus, investing in Berkshire’s largest stock positions won’t be a bad proposition. The table shows Berkshire’s 15 largest stock holdings. We have selected five sound stocks from the table that flaunt a Zacks Rank #2 (Buy). American Express Company (NYSE:AXP) provides charge and credit payment card products and travel-related services to consumers and businesses. The Zacks Consensus Estimate for its current-year earnings climbed 10% in the last 60 days. AXP stock has yielded a superb return of 15.6% in the last six months. The company is expected to return 21.8% this year, higher than the industry’s projected return of 10%. Moody’s Corporation (NYSE:MCO) provides credit ratings; and credit, capital markets, and economic related research, data, and analytical tools. The Zacks Consensus Estimate for its current-year earnings jumped 15.7% in the last 60 days. MCO stock has given a stellar return of 27.9% in the last six months. The company is expected to return 24.1% this year, compared with the industry’s estimated return of 10%. Southwest Airlines Co (NYSE:LUV) operates a passenger airline that provides scheduled air transportation services in the United States and international markets. The Zacks Consensus Estimate for its current-year earnings increased 9.6% in the last 60 days. LUV stock has given a steady return of 10.1% in the last six months. The company is expected to return 42.9% this year, compared with the industry’s estimated return of 13.4%. Delta Air Lines, Inc. (NYSE:DAL) provides scheduled air transportation for passengers and cargo in the United States and internationally. The Zacks Consensus Estimate for its current-year earnings advanced 15.9% in the last 60 days. DAL stock has given a healthy return of 14.5% in the last six months. The company is expected to return 28.6% this year, higher than the industry’s estimated return of 13.4%. General Motors Company (NYSE:GM), together with its subsidiaries, designs, builds, and sells cars, trucks, crossovers, and automobile parts. The Zacks Consensus Estimate for its current-year earnings increased 7.9% in the last 60 days. GM stock, which is part of the Automotive – Domestic industry, has given a superb return of 14.9% in the last six months and is expected to continue the winning run in the near term. 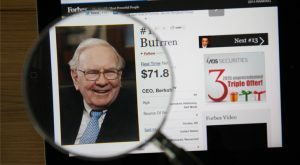 Article printed from InvestorPlace Media, https://investorplace.com/2018/02/buffett-roots-stocks-over-bonds-annual-letter-5-picks-ggsyn/.